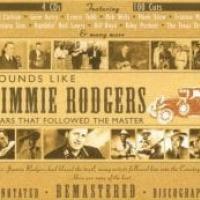 View Cart “Various – Sounds Like Jimmy Rodgers – Stars That Followed The Master – 4 CD” has been added to your cart. 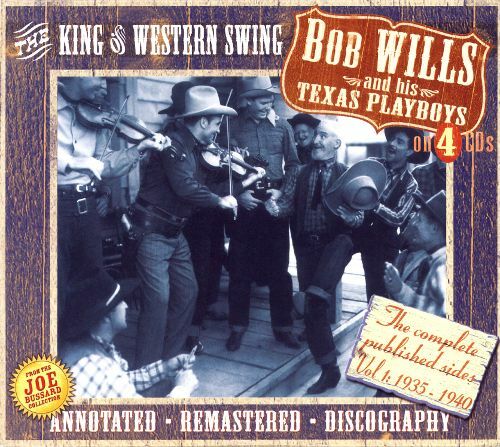 JSP's outstanding four-CD Bob Wills anthology consists of 100 classic Western swing performances recorded between September 1935 and April 1940 in Dallas, Fort Worth, Chicago, and Saginaw. 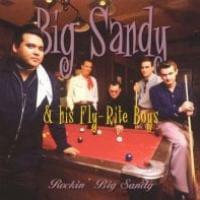 Almost all of these 78-rpm records came out under the name of the Texas Playboys; the only exceptions are two fiddle and guitar duets by Bob Wills and Sleepy Johnson and a pair of early ditties by the Fort Worth Doughboys. This is most tantalizing, as Wills, always a capable fiddler and an exuberant vocalist, also worked for a while with the original Light Crust Doughboys, a fun little outfit whose earliest recordings have yet to be comprehensively reissued. 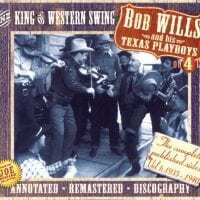 JSP has done with Bob Wills what it does with every artist deemed worthy of such a rigorous retrospective. The well-chosen, carefully remastered recordings are laid out in chronological order and complete discographical information is enclosed, along with informative liner notes in the form of an extended biographical essay appended with a small but useful bibliography. This wonderfully uplifting music is a natural byproduct of mingling cultural currents during the years immediately preceding the Second World War. Change was literally in the air, and phonograph records and radio were the media that accelerated new developments and encouraged cross-pollination. Bob Wills listened to recordings by the Original Dixieland Jazz Band, Leroy Carr, Fats Waller, and Bessie Smith. He became inspired by Louis Armstrong, King Oliver, Earl Hines, James P. Johnson, Jimmie Lunceford, and Lionel Hampton. Wills heard live big-band broadcasts originating hundreds of miles away and began combining stylistic tropes that were unmixable according to entrenched bigoted social convention. Wills created a hybrid genre using Afro-American jazz and blues and his own home-grown brand of Western country music, beautifully tempered with melodies he learned from the Mexican population in Texas. Western swing cut through all kinds of socially imposed racial and ethnic delineations. It was also very entertaining, and still is. Anyone interested in this genre should seriously consider obtaining and absorbing JSP's well-researched and refreshingly affordable Bob Wills collection.